This activity feed shows all Arthur Van Riper Jr's 3553 contributions to our community's mission to connect the human family on one free tree. You can also view all recent changes on WikiTree, the changes to profiles with surnames you're following, or the changes to profiles with a particular surname such as . Would you like to thank Arthur for helping with our mission to connect the human family on one tree? Click thank-you links by any particularly valuable contributions below. If Arthur made helpful contributions to his own family history award him a Family Star. If Arthur has helped you or someone else, award him a Generous Genealogist Star. If Arthur has made many valuable contributions to the WikiTree community, beyond his own family history, award him a Community Star. 06:08: Arthur Van Riper Jr added Margaret Wetzel as spouse for Paul Keeney. [Thank Arthur for this] 06:08: Arthur Van Riper Jr created Margaret Wetzel. (Imported data from GEDCOM upload #137151, Person I16) [Thank Arthur for this] 06:07: Arthur Van Riper Jr added Calvin Keeney as child for Paul Keeney. [Thank Arthur for this] 06:07: Arthur Van Riper Jr created Calvin Keeney. (Imported data from GEDCOM upload #137151, Person I23) [Thank Arthur for this] 06:07: Arthur Van Riper Jr added Bernard Keeney as child for Paul Keeney. [Thank Arthur for this] 06:07: Arthur Van Riper Jr created Bernard Keeney. (Imported data from GEDCOM upload #137151, Person I22) [Thank Arthur for this] 06:05: Arthur Van Riper Jr added Paul Keeney as child for Paul Keeney. [Thank Arthur for this] 06:05: Arthur Van Riper Jr created Paul Keeney. (Imported data from GEDCOM upload #137151, Person I21) [Thank Arthur for this] 06:05: Arthur Van Riper Jr added Lillie Keeney as child for Paul Keeney. [Thank Arthur for this] 06:05: Arthur Van Riper Jr created Lillie Keeney. (Imported data from GEDCOM upload #137151, Person I15) [Thank Arthur for this] 06:03: Arthur Van Riper Jr added Eleanor Keeney as child for Paul Keeney. [Thank Arthur for this] 06:03: Arthur Van Riper Jr created Eleanor Keeney. 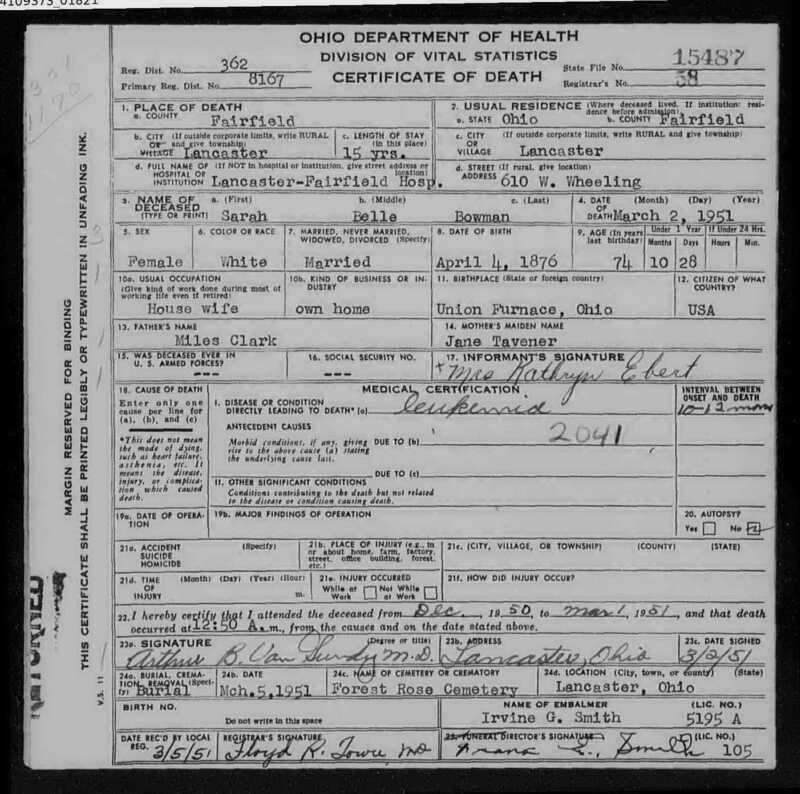 (Imported data from GEDCOM upload #137151, Person I18) [Thank Arthur for this] 06:02: Arthur Van Riper Jr added Edsel G. Northrop (1921-1988) as child for Clara Naomi (Withem) Northrop (1899-1981). [Thank Arthur for this] 06:02: Arthur Van Riper Jr created Edsel G. Northrop (1921-1988). (Imported data from GEDCOM upload #137151, Person I36) [Thank Arthur for this] 05:16: Arthur Van Riper Jr edited the Biography for [Living Van Riper]. [Thank Arthur for this] 05:15: Arthur Van Riper Jr added [Living Van Riper] as child for [Living Heather]. [Thank Arthur for this] 05:15: Arthur Van Riper Jr created [Living Van Riper]. 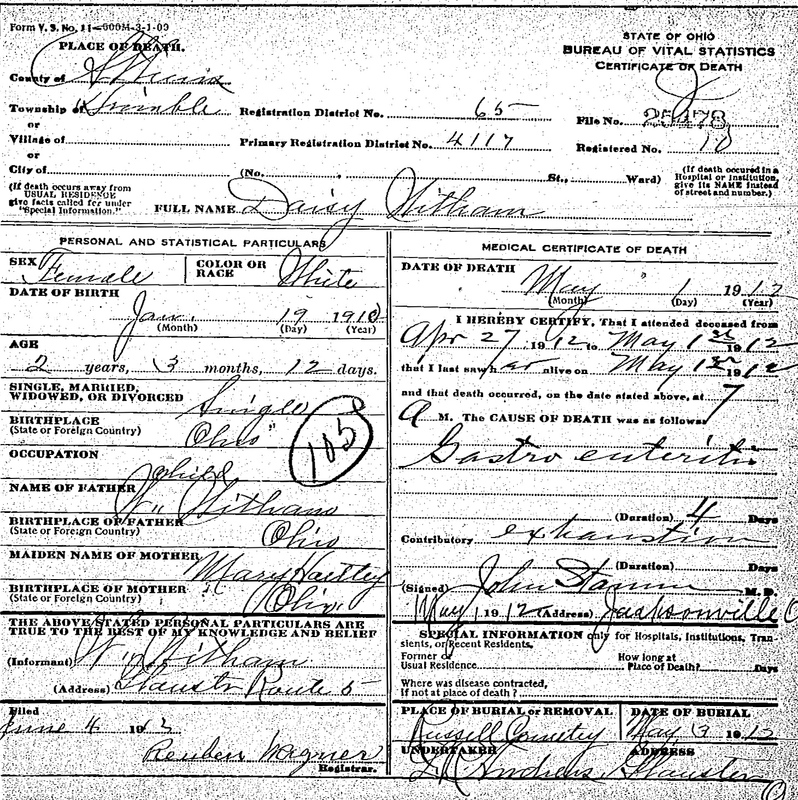 (Imported data from GEDCOM upload #137151, Person I56) [Thank Arthur for this] 05:05: Arthur Van Riper Jr added Withins-2-4.jpg as Background Image for Daisy Arnetta Withins (abt.1910-1912) [Thank Arthur for this] 05:05: Arthur Van Riper Jr edited the Background Image for Daisy Arnetta Withins (abt.1910-1912). [Thank Arthur for this] 05:05: Arthur Van Riper Jr added Withins-2-4.jpg as Primary Photo for Daisy Arnetta Withins (abt.1910-1912) [Thank Arthur for this] 05:05: Arthur Van Riper Jr edited the Primary Photo for Daisy Arnetta Withins (abt.1910-1912). [Thank Arthur for this] 05:05: Arthur Van Riper Jr uploaded Withins-2-4.jpg for Daisy Arnetta Withins (abt.1910-1912). [Thank Arthur for this] 05:03: Arthur Van Riper Jr edited the Photo Date, Image Type and Photo Type on Withins-2-1.jpg (Van Riper-81 updated photo) [Thank Arthur for this] 05:03: Arthur Van Riper Jr uploaded Withins-2-1.jpg for Daisy Arnetta Withins (abt.1910-1912). [Thank Arthur for this] 05:01: Arthur Van Riper Jr edited the Primary Photo for Daisy Arnetta Withins (abt.1910-1912). [Thank Arthur for this] 05:01: Arthur Van Riper Jr uploaded Withins-2.jpg for Daisy Arnetta Withins (abt.1910-1912). 21:50: Arthur Van Riper Jr edited the Primary Photo for Lora E Withem (1896-1989). [Thank Arthur for this] 21:50: Arthur Van Riper Jr uploaded Withem-87.jpg for Lora E Withem (1896-1989). [Thank Arthur for this] 21:41: Arthur Van Riper Jr edited the Biography, Birth Date, Death Date and Death Place for Lora E Withem (1896-1989). [Thank Arthur for this] 21:32: Arthur Van Riper Jr added Lora E Withem (1896-1989) as sibling for Ruth Elizabeth (Withem) Skinner (1888-1951). [Thank Arthur for this] 21:32: Arthur Van Riper Jr created Lora E Withem (1896-1989). (Imported data from GEDCOM upload #137151, Person I61) [Thank Arthur for this] 16:11: Arthur Van Riper Jr edited the Biography for Launa Rose (Withem) Barrowman (1893-1965). [Thank Arthur for this] 16:07: Arthur Van Riper Jr added Launa Rose (Withem) Barrowman (1893-1965) as sibling for Ruth Elizabeth (Withem) Skinner (1888-1951). [Thank Arthur for this] 16:07: Arthur Van Riper Jr created Launa Rose (Withem) Barrowman (1893-1965). (Imported data from GEDCOM upload #137151, Person I64) [Thank Arthur for this] 14:16: Arthur Van Riper Jr removed Withem-85.jpg as Primary Photo for Ruth Elizabeth (Withem) Skinner (1888-1951) [Thank Arthur for this] 14:16: Arthur Van Riper Jr edited the Primary Photo for Ruth Elizabeth (Withem) Skinner (1888-1951). [Thank Arthur for this] 14:16: Arthur Van Riper Jr edited the Primary Photo for Ruth Elizabeth (Withem) Skinner (1888-1951). [Thank Arthur for this] 14:16: Arthur Van Riper Jr uploaded Withem-85.jpg for Ruth Elizabeth (Withem) Skinner (1888-1951). 18:45: Arthur Van Riper Jr added Ruth Elizabeth (Withem) Skinner (1888-1951) as sibling for Clara Naomi (Withem) Northrop (1899-1981). [Thank Arthur for this] 18:45: Arthur Van Riper Jr created Ruth Elizabeth (Withem) Skinner (1888-1951). 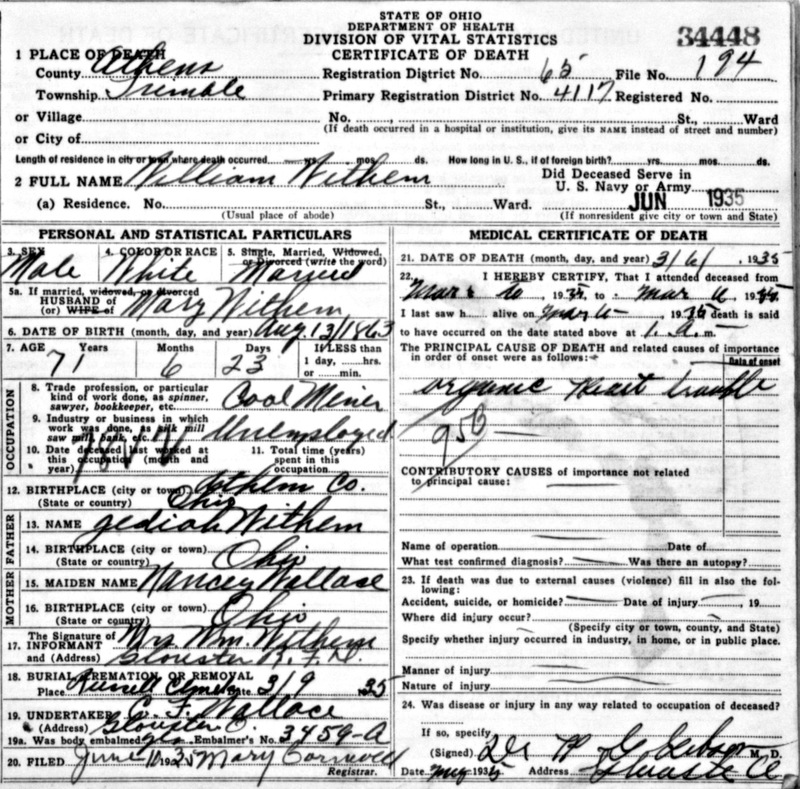 (Imported data from GEDCOM upload #137151, Person I63) [Thank Arthur for this] 14:29: Arthur Van Riper Jr removed Withem-84.jpg as Primary Photo for Jesse James Withem (1885-1933) [Thank Arthur for this] 14:29: Arthur Van Riper Jr edited the Primary Photo for Jesse James Withem (1885-1933). [Thank Arthur for this] 14:29: Arthur Van Riper Jr edited the Primary Photo for Jesse James Withem (1885-1933). [Thank Arthur for this] 14:29: Arthur Van Riper Jr uploaded Withem-84.jpg for Jesse James Withem (1885-1933). [Thank Arthur for this] 14:24: Arthur Van Riper Jr added Jesse James Withem (1885-1933) as sibling for Clara Naomi (Withem) Northrop (1899-1981). [Thank Arthur for this] 14:24: Arthur Van Riper Jr created Jesse James Withem (1885-1933). (Imported data from GEDCOM upload #137151, Person I62) [Thank Arthur for this] 05:17: Arthur Van Riper Jr added Withem-83.jpg as Primary Photo for Mary Melvina Hartley (1868-1948) [Thank Arthur for this] 05:17: Arthur Van Riper Jr edited the Primary Photo for Mary Melvina Hartley (1868-1948). [Thank Arthur for this] 05:17: Arthur Van Riper Jr edited the Primary Photo for Mary Melvina Hartley (1868-1948). [Thank Arthur for this] 05:17: Arthur Van Riper Jr uploaded Hartley-3963.jpg for Mary Melvina Hartley (1868-1948). [Thank Arthur for this] 05:15: Arthur Van Riper Jr edited the People in the Photo and Photo Date on Withem-83.jpg (Van Riper-81 updated photo) [Thank Arthur for this] 05:15: Arthur Van Riper Jr edited the data for William A Withem (1863-aft.1935). [Thank Arthur for this] 05:15: Arthur Van Riper Jr added Mary Melvina Hartley (1868-1948) as mother for Clara Naomi (Withem) Northrop (1899-1981). [Thank Arthur for this] 05:15: Arthur Van Riper Jr created Mary Melvina Hartley (1868-1948). 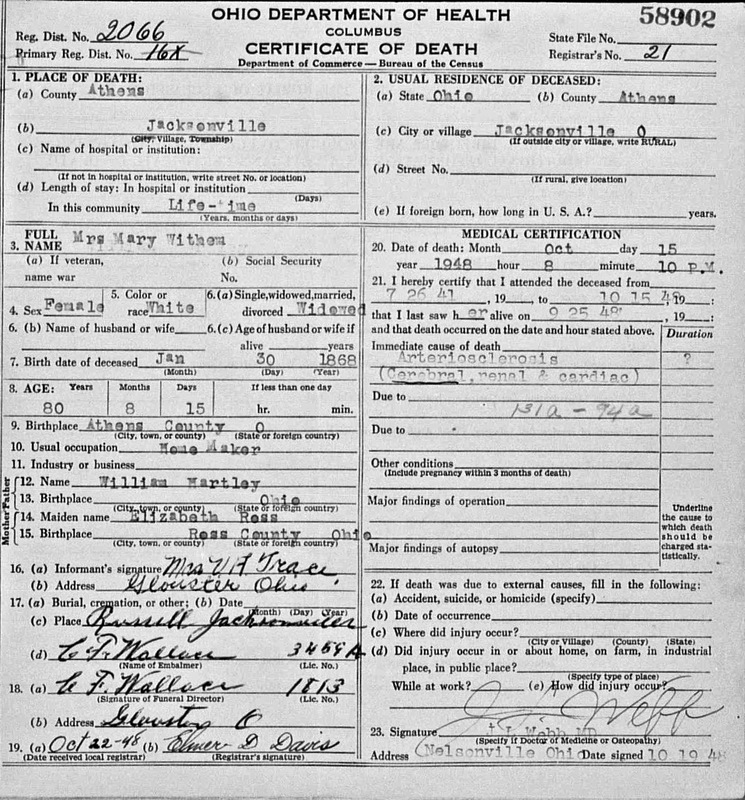 (Imported data from GEDCOM upload #137151, Person I54) [Thank Arthur for this] 04:46: Arthur Van Riper Jr edited the Biography, Birth Date, Death Date and Death Place for William A Withem (1863-aft.1935). [Thank Arthur for this] 04:37: Arthur Van Riper Jr uploaded Withem-83-1.jpg for William A Withem (1863-aft.1935). [Thank Arthur for this] 04:36: Arthur Van Riper Jr edited the Photo Date, Image Type and Photo Type on Withem-83.jpg (Van Riper-81 updated photo) [Thank Arthur for this] 04:36: Arthur Van Riper Jr edited the Primary Photo for William A Withem (1863-aft.1935). 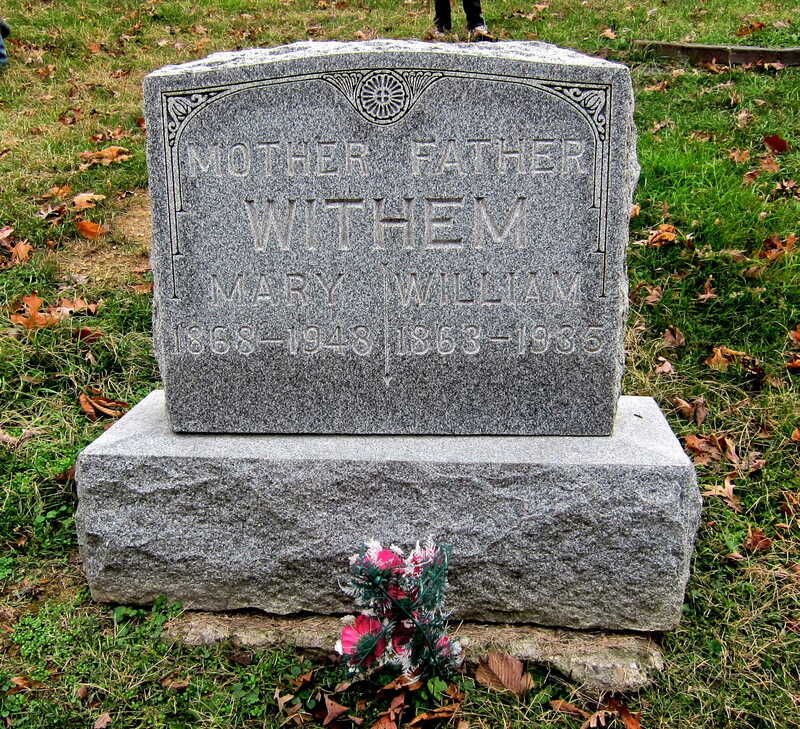 [Thank Arthur for this] 04:36: Arthur Van Riper Jr uploaded Withem-83.jpg for William A Withem (1863-aft.1935). 22:35: Arthur Van Riper Jr removed Bowman-9405.jpg as Primary Photo for Marguerite Jane (Bowman) Clagg (1914-2010) [Thank Arthur for this] 22:35: Arthur Van Riper Jr edited the Primary Photo for Marguerite Jane (Bowman) Clagg (1914-2010). [Thank Arthur for this] 22:32: Arthur Van Riper Jr uploaded Bowman-9405-1.jpg for Marguerite Jane (Bowman) Clagg (1914-2010). 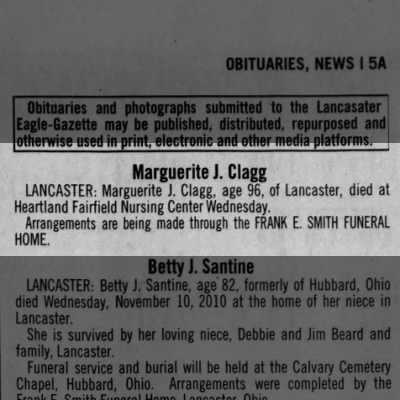 [Thank Arthur for this] 22:29: Arthur Van Riper Jr edited the Primary Photo for Marguerite Jane (Bowman) Clagg (1914-2010). [Thank Arthur for this] 22:29: Arthur Van Riper Jr uploaded Bowman-9405.jpg for Marguerite Jane (Bowman) Clagg (1914-2010). [Thank Arthur for this] 22:25: Arthur Van Riper Jr edited the Biography for Marguerite Jane (Bowman) Clagg (1914-2010). 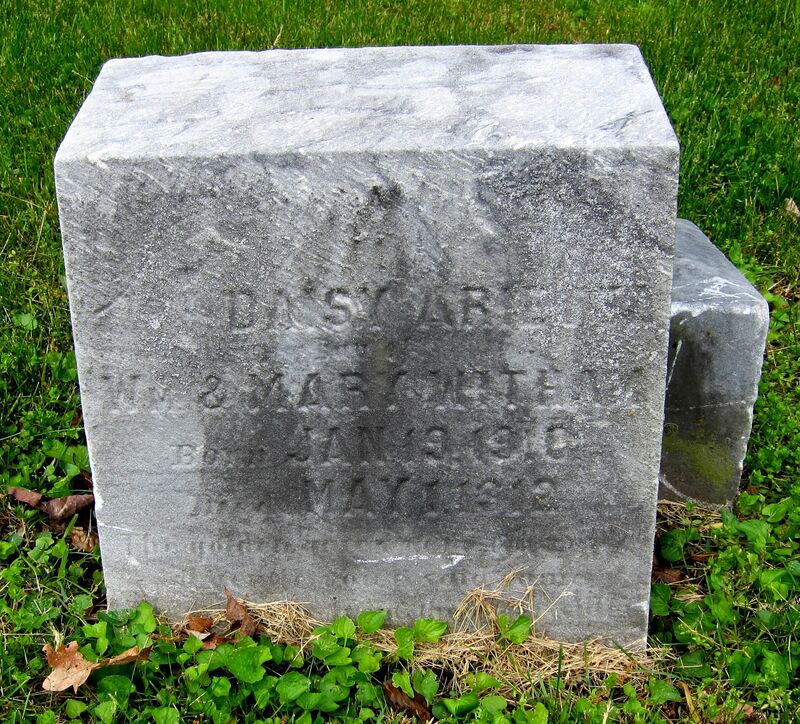 [Thank Arthur for this] 22:20: Arthur Van Riper Jr added Marguerite Jane (Bowman) Clagg (1914-2010) as child for George Marion Bowman (1868-1953). 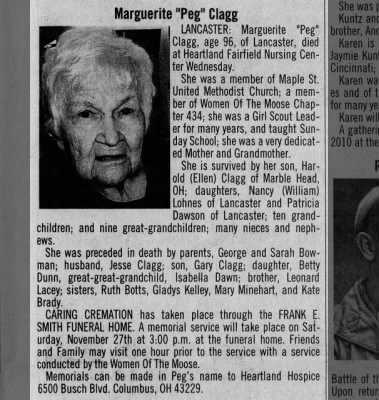 [Thank Arthur for this] 22:20: Arthur Van Riper Jr created Marguerite Jane (Bowman) Clagg (1914-2010). 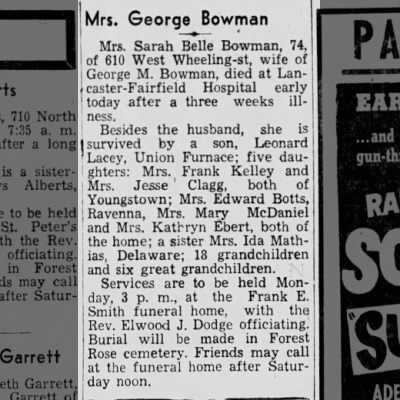 (Imported data from GEDCOM upload #136814, Person I79) [Thank Arthur for this] 15:53: Arthur Van Riper Jr added Catherine B Bowman (1912-1962) as child for George Marion Bowman (1868-1953). [Thank Arthur for this] 15:53: Arthur Van Riper Jr created Catherine B Bowman (1912-1962). 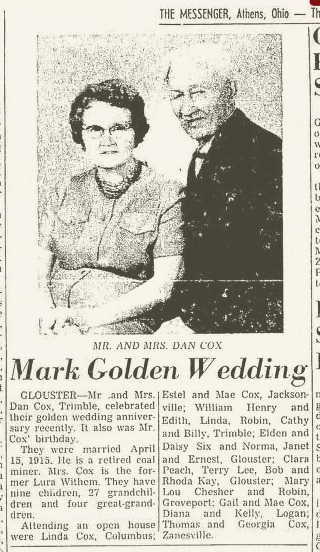 (Imported data from GEDCOM upload #136814, Person I78) [Thank Arthur for this] 15:11: Arthur Van Riper Jr added Mary Dorothy Bowman (1910-1959) as child for George Marion Bowman (1868-1953). [Thank Arthur for this] 15:11: Arthur Van Riper Jr created Mary Dorothy Bowman (1910-1959). 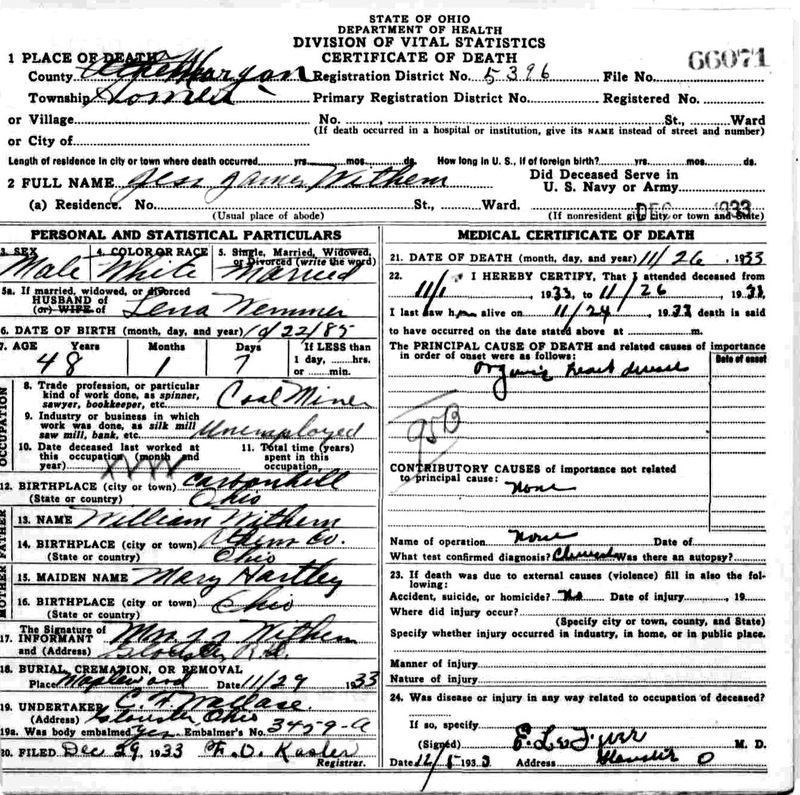 (Imported data from GEDCOM upload #136814, Person I77) [Thank Arthur for this] 14:02: Arthur Van Riper Jr added Ruth Fern (Bowman) Botts (1908-1990) as child for George Marion Bowman (1868-1953). 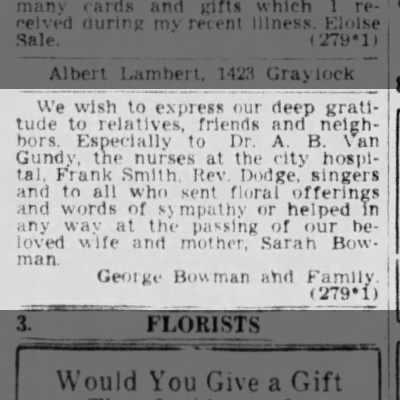 [Thank Arthur for this] 14:02: Arthur Van Riper Jr created Ruth Fern (Bowman) Botts (1908-1990). 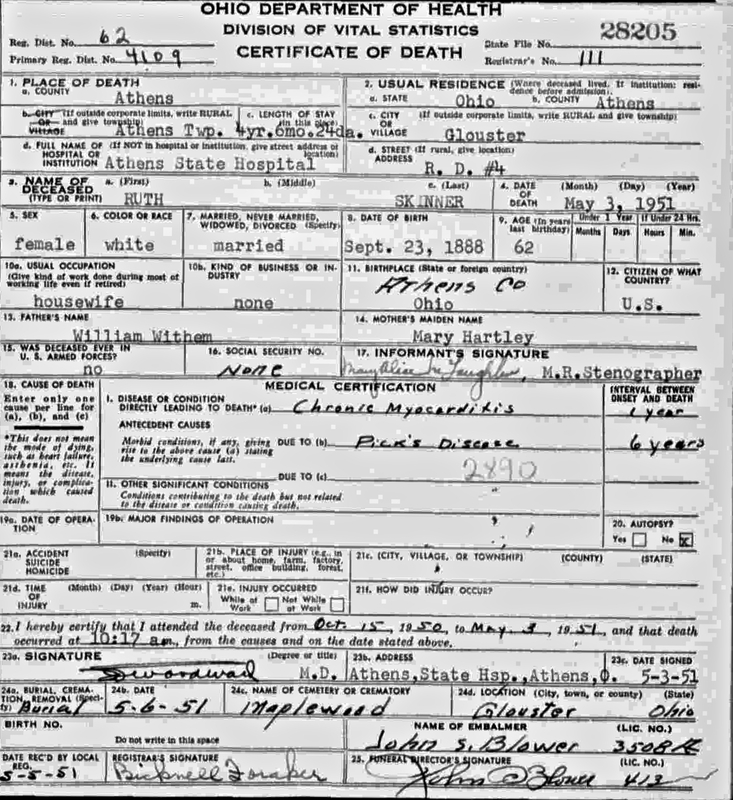 (Imported data from GEDCOM upload #136814, Person I75) [Thank Arthur for this] 07:02: Arthur Van Riper Jr uploaded Bowman-9401-1.jpg for Gladys May Bowman (1905-1988). [Thank Arthur for this] 06:59: Arthur Van Riper Jr edited the Primary Photo for Gladys May Bowman (1905-1988). 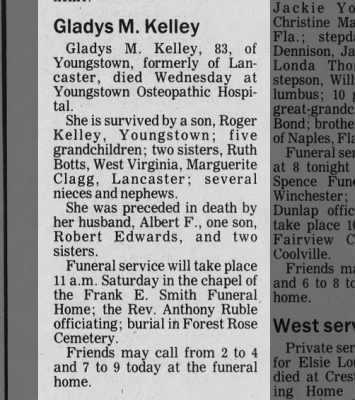 [Thank Arthur for this] 06:59: Arthur Van Riper Jr uploaded Bowman-9401.jpg for Gladys May Bowman (1905-1988). [Thank Arthur for this] 06:56: Arthur Van Riper Jr added Gladys May Bowman (1905-1988) as child for George Marion Bowman (1868-1953). 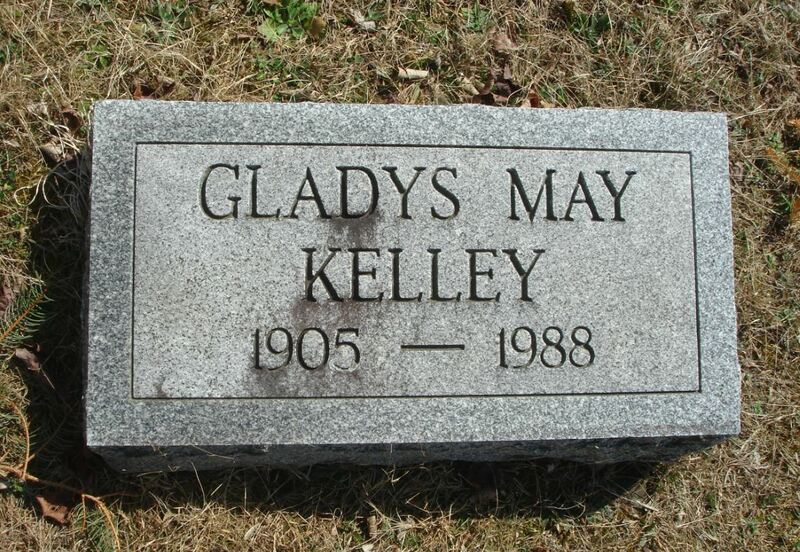 [Thank Arthur for this] 06:56: Arthur Van Riper Jr created Gladys May Bowman (1905-1988). (Imported data from GEDCOM upload #136814, Person I76) [Thank Arthur for this] 06:18: Arthur Van Riper Jr uploaded Clark-49740-4.jpg for Sarah Belle (Clark) Bowman (1876-1951). [Thank Arthur for this] 06:17: Arthur Van Riper Jr uploaded Clark-49740-3.jpg for Sarah Belle (Clark) Bowman (1876-1951). [Thank Arthur for this] 06:15: Arthur Van Riper Jr uploaded Clark-49740-2.jpg for Sarah Belle (Clark) Bowman (1876-1951).